Over the next 6 months, I’ll be testing out a new platform that helps you manage & promote on social media called Meet Soci. It’s still pretty new to me and I was playing around with it over the weekend and discovered that you can create sweepstakes on Facebook! Bloggers & businesses check it out. If you end up signing up, use the code SIMPLYSTACIE. I’ll be posting a review of it over on my blogging blog after I’ve had more of a chance to use it. 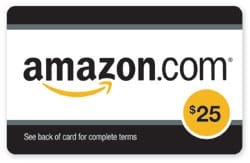 My first giveaway is for a $25 Amazon GC or $25 USD Paypal cash – winner’s choice! Open worldwide. Visit Simply Stacie on Facebook to enter. Reebok Dance Gear Is back For Summer! I would love to win this awesome giveaway,Enter me! Thanks for the wonderful giveaway and God Bless!